This is a Veteran-owned and operated quilt shop that sells fabric, quilting supplies, and holds classes for quilting. We also hold free classes for Veterans and sell Veteran's and spouse/caregiver's handmade products. Disabled Veteran, Lacy Spurgeon, is the owner of Freedom Bound Quilt Company. In 2008, Lacy enlisted into the Military. She graduated from BCT/AIT, June 25, 2009. In October 2009, she was deployed to Egypt where she was sexually assaulted by a peer, and for the next 5 years she dealt with the effects of Post-Traumatic Stress. In 2011, she was physically injured during a training accident and suffered a back injury. Due to this injury, she moved home, to Ohio, where she was treated and continued to work on her recovery. In 2016, after 5 years of depression, anxiety, and trouble working, Lacy began attending a quilt group in Archbold. Once she started learning to quilt, she bought her own sewing machine and used quilting to aid in her recovery. Quilting became an alternative form of therapy and she wanted to share that with other Veterans. When a nonprofit program, to teach Veterans how to sew, was unsuccessful, Lacy became aware of the need to have a quilt shop in her area. She decided to join the Semper Fi Fund’s Apprenticeship Program and learned everything she needed to know about owning a business. 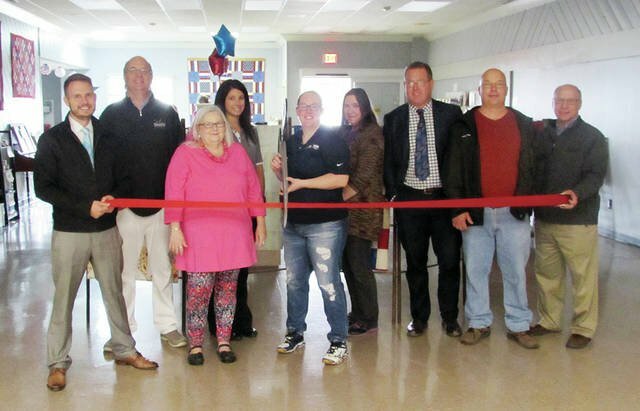 With the help of The Semper Fi Fund and their loyal donors, Freedom Bound Quilt Company was formed and eventually was opened October 12, 2017. In order to use this shop to give back to the community, Lacy created a space in her shop to allow Veterans and Spouses/Caregivers of Veterans to sell hand-made products. Freedom Bound Quilt Company has a wide variety of classes, which are free for Veterans, long-arm and domestic quilting services, Bag of the Month, Block of the Month, and Row by Row. Freedom Bound Quilt Company will also participate in the Itty Bitty Shop Hop. There have been many changes and with the addition of Lacy’s new business partner, Freedom Bound has been able to grow, add more retail, and improve features in the shop. In the future, Lacy hopes to create jobs for local Veterans and continue to support the community and programs for Veterans.